Isn’t that the best texture? 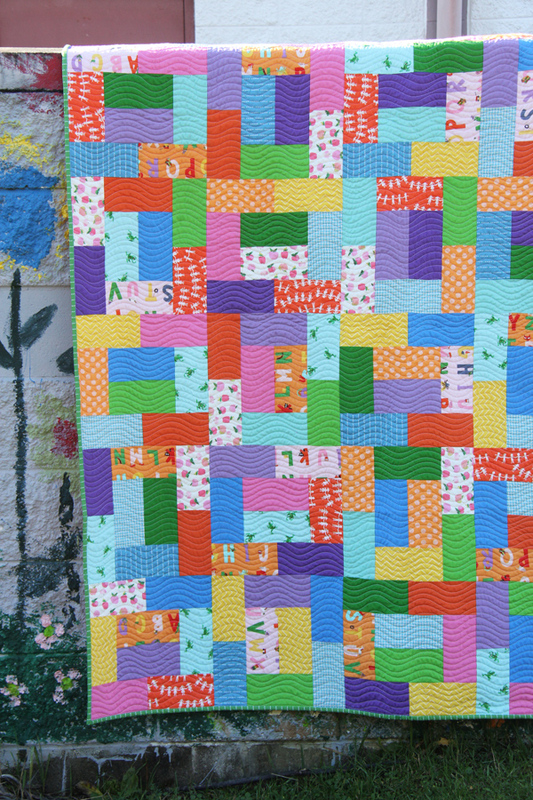 The wavy lines is my new favorite quilting design…for now. Fat Quarter Friday is another new pattern I put into my shop last week. I made these quilts ages ago…but it seems appropriate to share them now since the fabric I used comes out to stores this week. So basically it was good that I procrastinated posting these quilts for 6 months so you can buy the fabric now instead of in 6 months! If you ever need help finding ways to justify procrastination…I’m your girl. 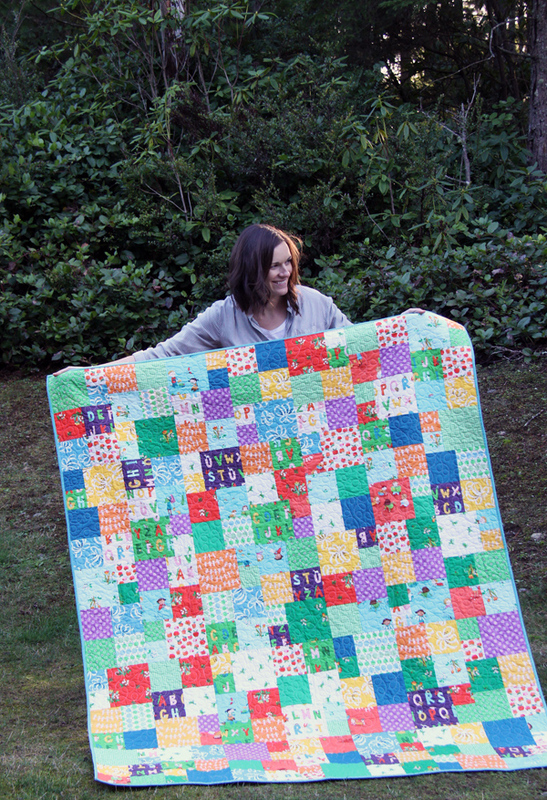 Fat Quarter Friday includes instructions for two super easy fat quarter quilts you can make in a weekend. They are both super fast, and great for a bunch of fat quarters you don’t have a plan for. 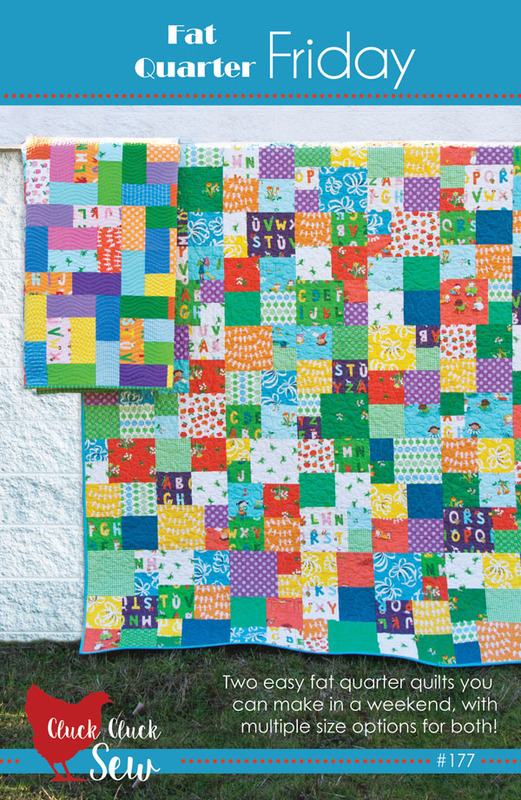 The squares quilt in the pattern works perfect for large scale prints like these in the Kinder collection by Heather Ross. Kathy quilted both of these quilts for me and as usual they are perfect. Since they are busy I wanted something super simple quilted on them and this is perfect. This Kinder collection is just shipping to stores now and it is so, so cute. 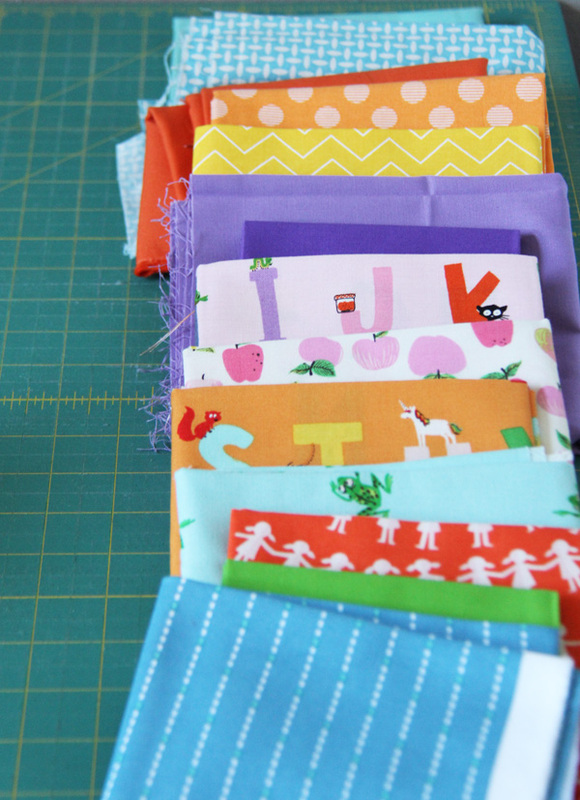 I chose some coordinating solids for my second strips quilt to keep it from being too busy. 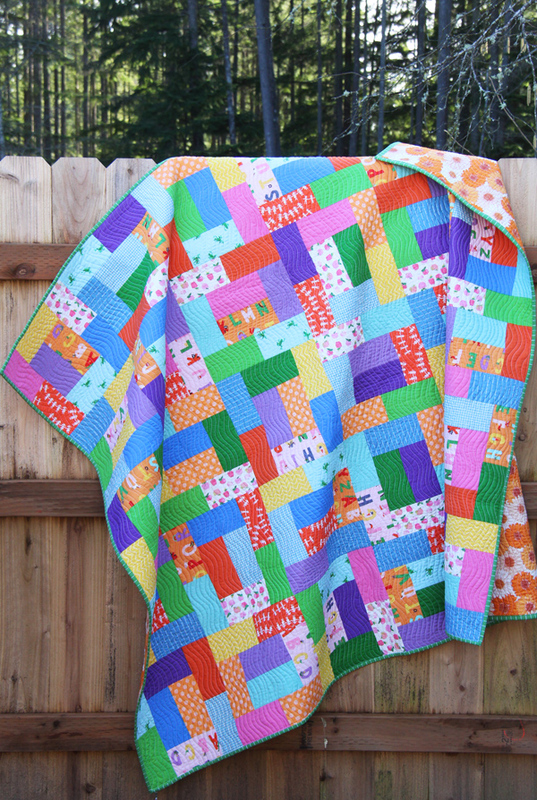 This strips quilt is a simplified version of Mingle, a baby quilt I made a few years ago. The strips are still large enough to show off prints in the fabric without chopping it up too much. The Fat Quarter Friday pattern can be found here as a PDF, or here as a Paper pattern. I love how you paired Katie Jump Rope with the new Kinder line! 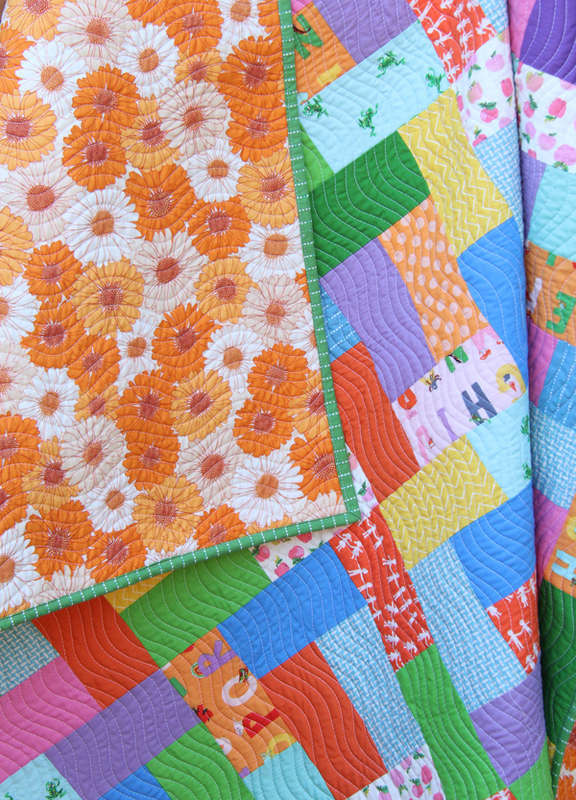 I also really like the orange daisy backing fabric. Who is the manufacturer? I’ll definitely be getting this new pattern. It’s so fun and I can imagine using lots of different fabric lines in it. Cute fabrics and quilts & model!!! Congratulations!!! I love these. I have so much fabric. I need to get started!! Happy Pattern made in Happy Fabric. Very Colorful. I have sooooooooo many fat quarters. This pattern would be perfect. Probably be a good idea to get the pattern and get started on a quilt for Christmas. 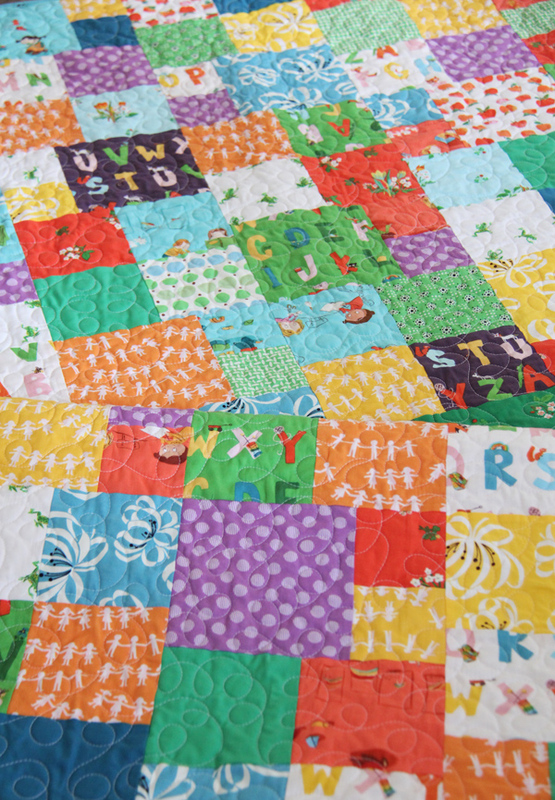 I am a slow piecer and quilter. Love the wavy pattern on the quilt. I discovered a smaller way pattern on my machine. It’s one of the built-in stitches. Love your new fat quarter friendly pattern. I am anxiously awaiting my pre-ordered Kinder bundle, so it is fun to see them in action! It is the cutest fabric, you’ll love it! 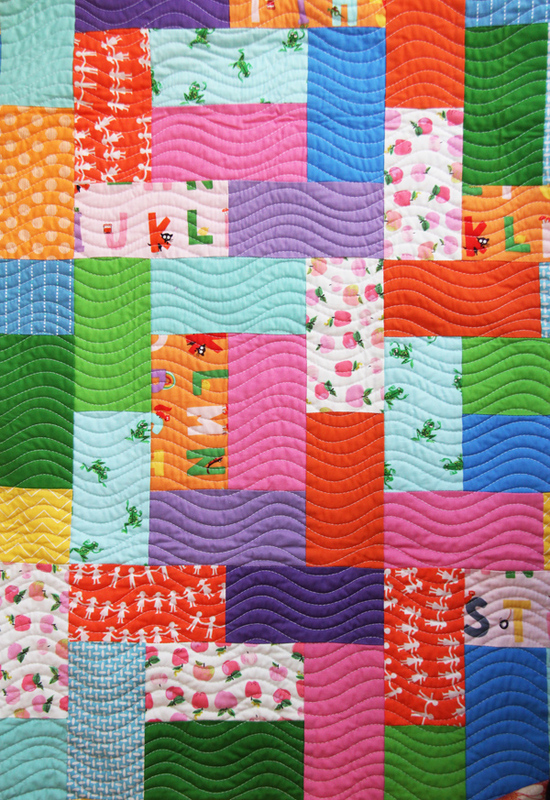 Just finished all the blocks for twin size “Mingle” …second version of your Fat Quarter Friday pattern. I used sports-themed fabric for my HS grandson. Once cut, it went very fast… the only things to match were the start and ending of each unit. I already have two 7-block rows attached. Re: Your comment on Mauve… I’m old enough to remember when mauve and dusty blue were the ONLY decent quilting fabrics available at fabric stores (late 1970’s). I actually made a Storm at Sea wall hanging in pink and blue. It came to a point when you just ached to see a yellow on the shelves! Forty years later we live in fabric color paradise!